First-grade deerskin leather reinforced with leather patch. 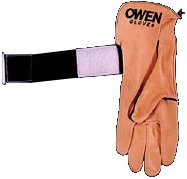 Thumb welt inserted for durability. 2" wrap-around strap.